Families of the men and boys who died in a Staffordshire mining disaster more than 100 years ago are holding a memorial service. Many of the bodies of the 80 miners were never recovered, following a flood at Diglake Colliery in January 1895. 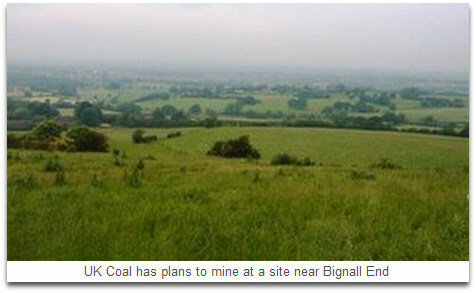 Villagers are campaigning against UK Coal's plans to carry out opencast mining in the area because of the sensitivity surrounding the site. A UK Coal representative said their sympathies were with the families. Judith Edgeley, from Audley, lost her great-great grandfather William Roberts in the disaster. She said: "We grew up knowing all about it. I lived on the street where William lived and, when you look at the records from the disaster, nearly every house was affected in that street. "There are still 77 men and boys down there whose bodies were never recovered." Ms Edgeley said the names of the missing men would be read out at the service, in the cemetery on Chapel Street in Bignall End. "There are still families around here who lost loved ones and it's important to show we don't forget them," she said. "These men and boys weren't afforded a Christian burial. These families had nowhere to go and grieve." Ms Edgeley added she was part of the campaign to stop mining in the area. "This sort of thing has been rearing its head for a long time," she said. "Various companies have wanted to come back and mine but, in the past, the fact there are bodies there has frightened people away." A UK Coal statement said: "Our sympathies are with the families of those lost at the Diglake Disaster of 1895. "We are, after all, a coal mining company and we regularly hold and attend similar memorials to colleagues and friends lost in the industry. "We, of course, remain sensitive to this issue. During our conversations with the community last year we discussed this matter at length. These discussions have helped shape the revised plans which are still being worked on. "The planning application we submit to Staffordshire County Council will be carefully thought through and designed to ensure the disaster area is not disturbed."